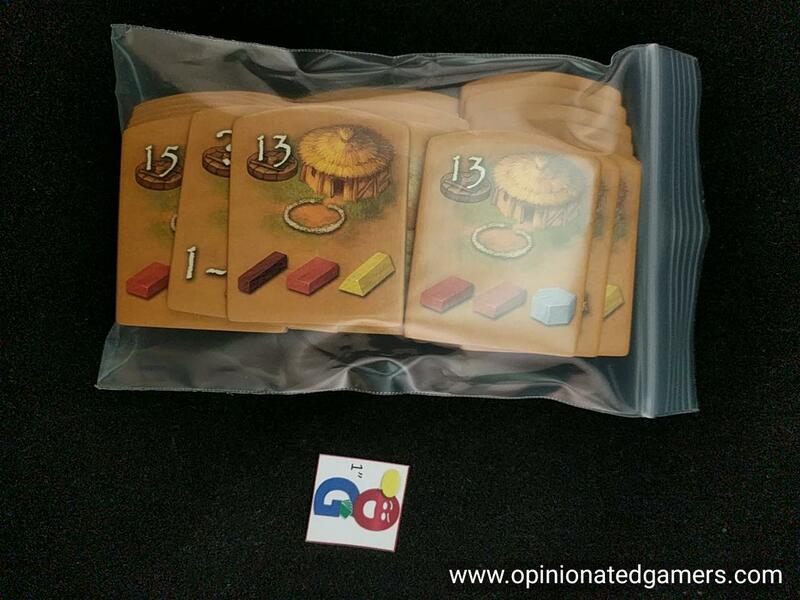 Dale Yu: Bagging up after Essen – new bag supplier found – Royal Bag! OK – just getting back and into the groove after the trip to Europe. As you might expect, this first week back can be quite hectic. I didn’t pull into the airport until about 10pm on Sunday night, and this gave me just enough time to get the bags into the car, drive home and then fall into bed to get ready for a full day of work on Monday. Good thing that I had enough time to write up most of my Essen recap pieces while on the plane home, because it’s been non-stop at work all week. In the evenings, I’ve been slowly unpacking the bags and finally getting to play with some of the games. I’ve got over 70 new games to look at, read the rules, punch the bits and whatnot. One of the great pleasures that I get from my games is the initial unboxing and organization of the components. Sometimes, there is a great insert which holds everything just right. More often than not, there is a huge empty cardboard box that needs something to help organize everything. Over the years, I’ve tried all sorts of different options for bags. I have found the most success buying bags in bulk from online sources (such as ULINE or Associated Bag), but the problem that I’ve had with these purchases is that it’s hard to get the bags in the quantities that I want. Oftentimes, the “case” size is 1,000 or even 2,000 bags of a certain size; and while I love to bag things up – this really poses a big storage issue for me. I can buy more mortal sized lots from Amazon, but when you buy them 100 at a time, you really lose on the cost as you no longer get bulk pricing. It has worked out great in the past when other local gamers have also needed bags at the same time. We have pooled together our needs, researched the different sizes and then bought two or three cases of bags and then split them between us. However, as you might suspect, gamers go through bags at different rates, and it’s getting harder and harder for us to coordinate our purchases. The other issue with this is that we have to agree on what sort of bag to get. As you might be aware, the thickness of the bag can make a huge difference. The thickness of the plastic is measured in “mils”, a measurement which equals one-thousandth of an inch. Some bags can be as thin as 1 mil, though these are quite fragile and often tear. I have also used bags as thick as 6 mil before; these are definitely more sturdy affairs – at times they seem almost indestructible. However, the thickness causes them to be slightly opaque (thus obscuring what’s inside); they are also a bit less flexible, and they do not fold easily nor fit into vac tray wells that nicely. So, I have found that I prefer 3 or 4 mil bags as they offer a nice balance between sturdiness and flexibility. 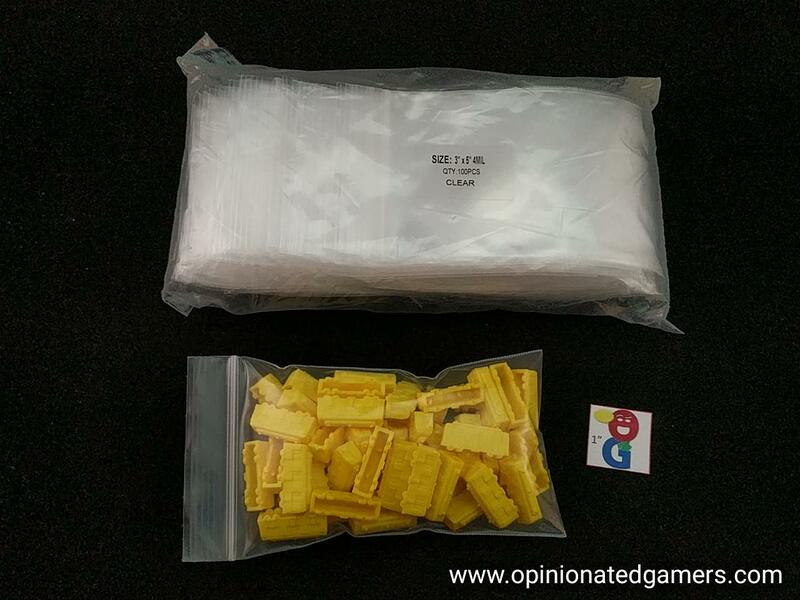 As you might expect, the thicker the bag (higher mil count), the more expensive the bags are because they necessarily have that much more plastic in them. I still have some of the 6 mil bags around, but I use those for other hobbies such as letterboxing which require the thicker plastic. 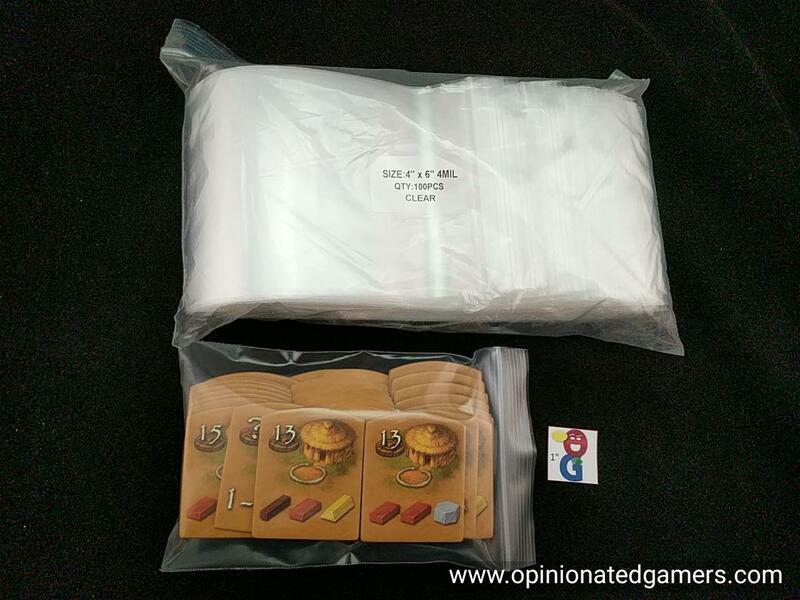 I have noticed an uptick in the percentage of games that now include bags in the box when you buy them – though I’m often not satisfied with the bags supplied. First, they are more often than not thinner than I like, usually 1 or 2 mil bags. Furthermore, they often are not particularly sized well for the components. 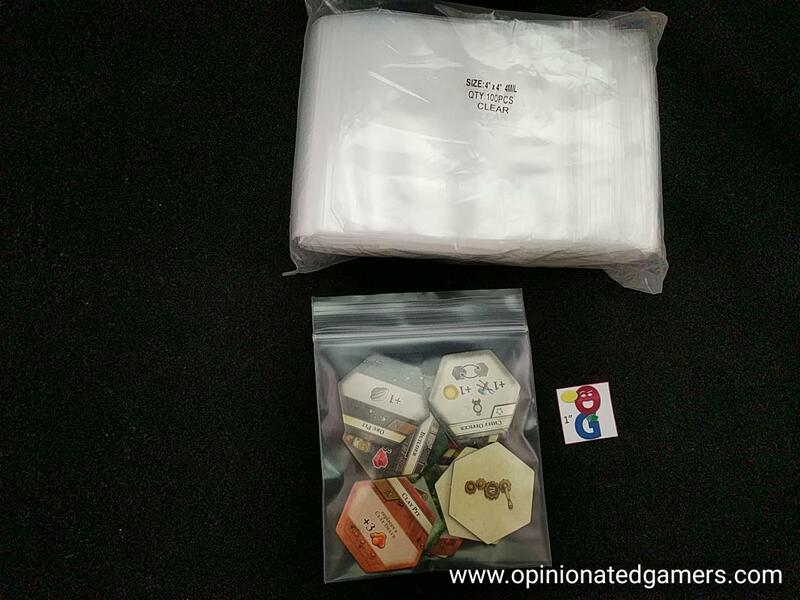 Bagging components nicely is important for me because I tend to store my games standing on their sides – thus, bagging the bits keeps them organized, even if the box tips over or things fall out of the inserts. Also, I find that it makes set up and clean up easier with an underlying organization to things. Anyways, the timing this summer has worked out great – I was actually running out of bags when I was contacted by Izzy at Royalbag.com. 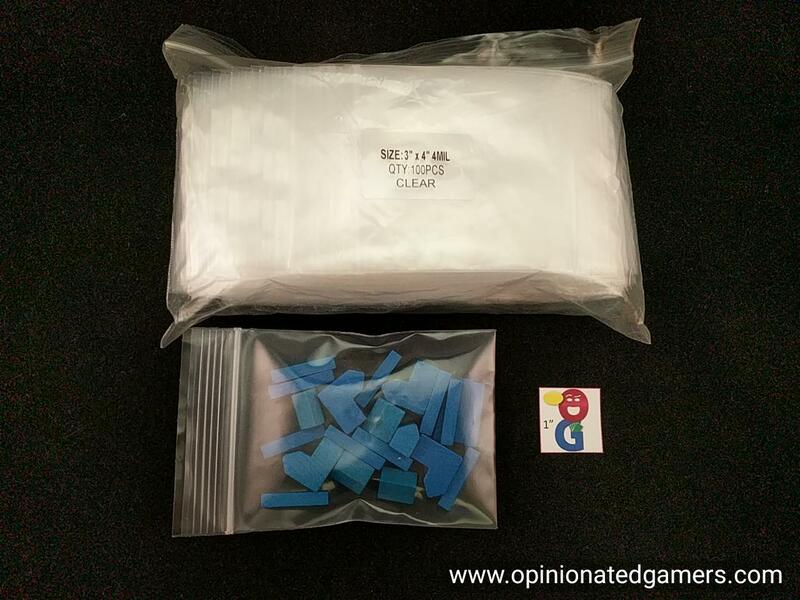 They have noticed that there is a definite market for gamers who need baggies, and they offered to send me some sample bags to try out, and to help them organize a bulk kit for boardgamers. I am not sure if I’ve ever reviewed plastic bags before – but this offer came at a perfect time. All of the bags are 4mil clear with nice recloseable seals. I know that sometimes it’s hard to visualize what the different sizes will hold, so I have taken a few pictures with some of the different sizes with components that you are probably familiar with. This is the 3×5 bag. It comfortably holds all the trains of a color for Ticket to Ride as well as the wooden scoring piece. This size bag also does well with small card decks (such as the tickets from TtR). This is the 2×3 bag, which I felt was a bit too small. But, as you can see here, it nicely holds all the food markers from a second edition Agricola. The problem for me is that which the depth is nice for small bits, the opening is just not quite wide enough. The gamers kit will use the 3×3 bag instead which should allow for a more useful amount to be held within. On the white background here for the 3×4 bag as it’s more in focus. This bag holds all the colored pieces for a player in Settlers of Catan. The 4×6 bag holds all the scoring huts from Stone Age. I also like to use this size of bag for decks of cards. If possible, I prefer not to use rubberbands on cards as they can sometimes leave a residue or mar the cards. The 4×4 bag is actually my favorite size, it just seems to work well for a lot of different sets of bits. 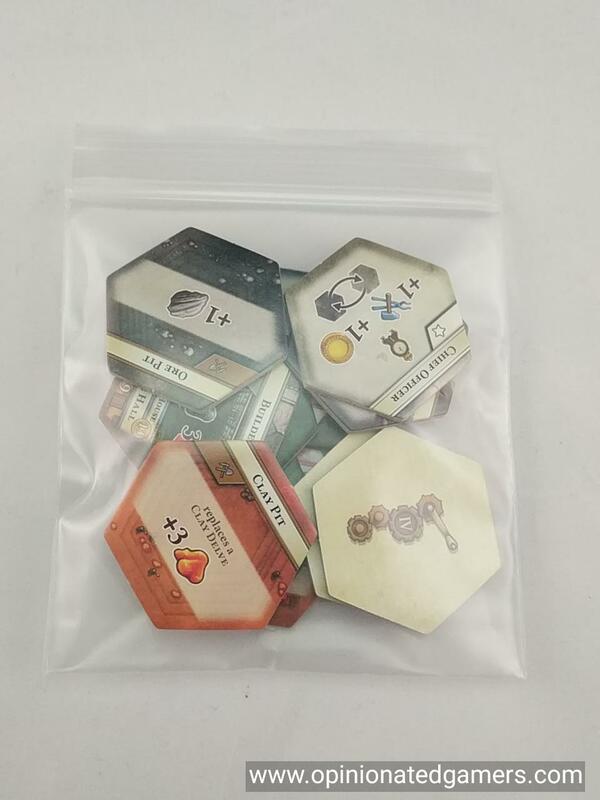 Here, you can see an entire era of hex tiles for the Colonists nicely within the bag. I have found Royal Bag super easy to work with, and they are actually quite flexible. 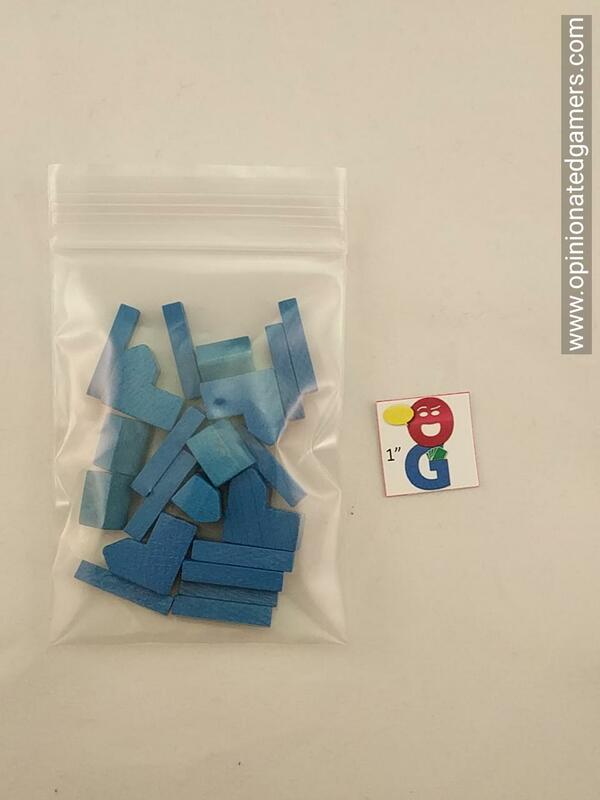 They also have plenty of other sizes available – I know that there are some people that like bags as small as 2×3”, but I personally find these a bit too small for most practical uses. But, if you want this size bag, I’m sure that they would be able to substitute them in for you. (I think it’s about $11 for 1000 bags of this size at Royal Bag!). Also, I know there is a small subset of folks who like the clear bags with the thick white stripe on one side which allows you to label them with a Sharpie marker. 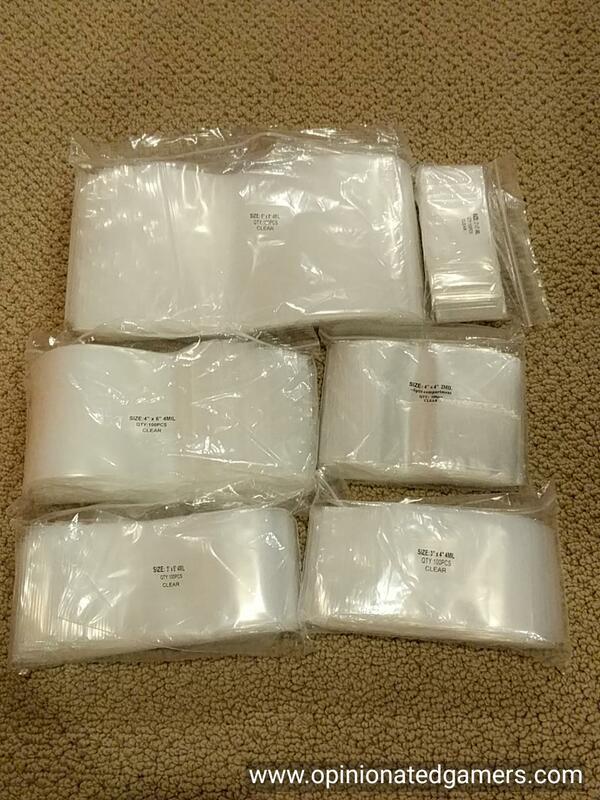 Most of the sizes of bags can also come in that form if you are that particular type of OCD and want to make sure that things go back in the exact same bags that they came out of… If there are other sizes that you’re interested in – they have nearly every size and thickness imaginable and in quantities down to 100. They even sell tinted bags – I had thought about even getting colored bags to match the player piece color; but then I thought that would maybe be too OCD, even for me! I’ve done some investigating on my own, and I can say that my own research of the prices shows Royal Bag to be a bit cheaper than my other previous online sources, and they are much cheaper than Amazon. 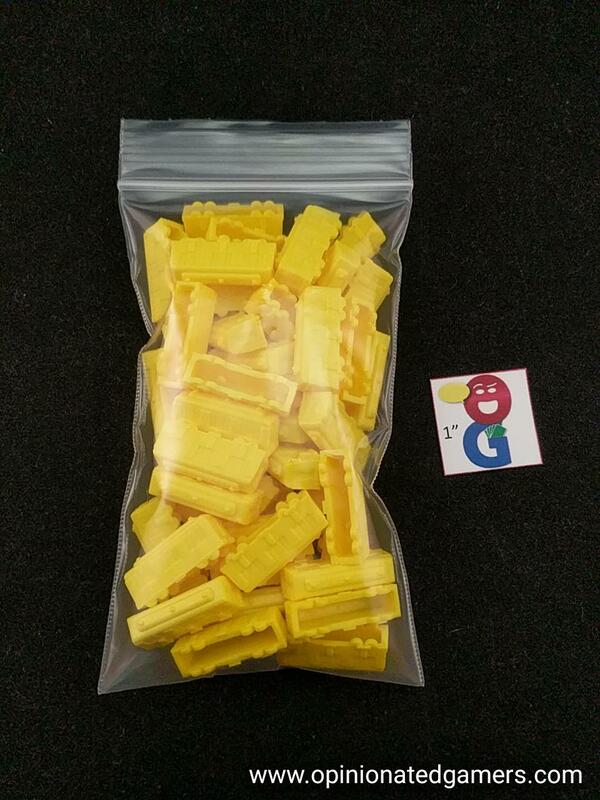 Additionally, it’s the only place that I’ve found where you can get bags in quantities as low as 100 per size. As I have found out, most other places usually have a minimum of 1,000 bags of a size. I suppose that you could still split this case of bags with someone else – but this assortment gets you a full supply of bags which will last you for years for less than the cost of a mid-sized game! 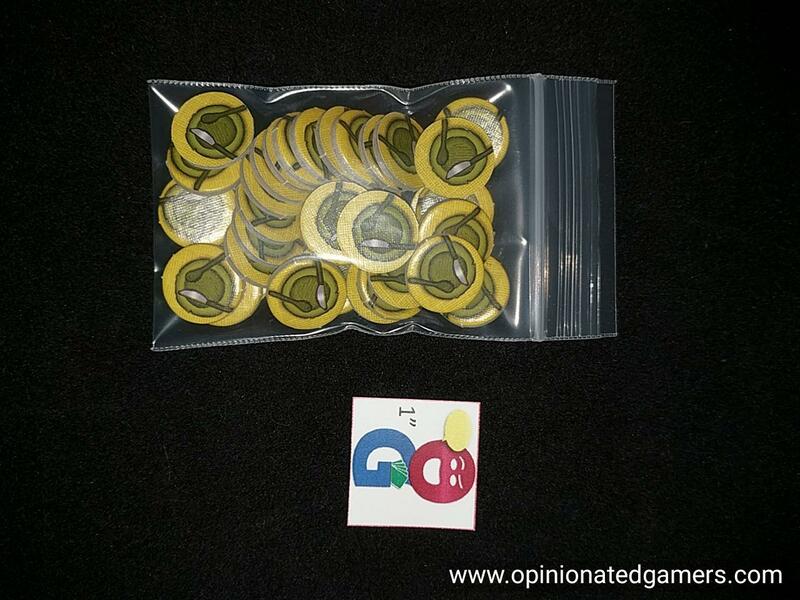 Anyways, I know that reviewing bags is not our usual sort of thing; but with many of you getting new games from Essen or due to the upcoming holidays, I thought this would be a nice time to talk about a great option for bags. Royal Bag is offering a nice special price between now and the holidays – $31 for the 1,000 bag selection. 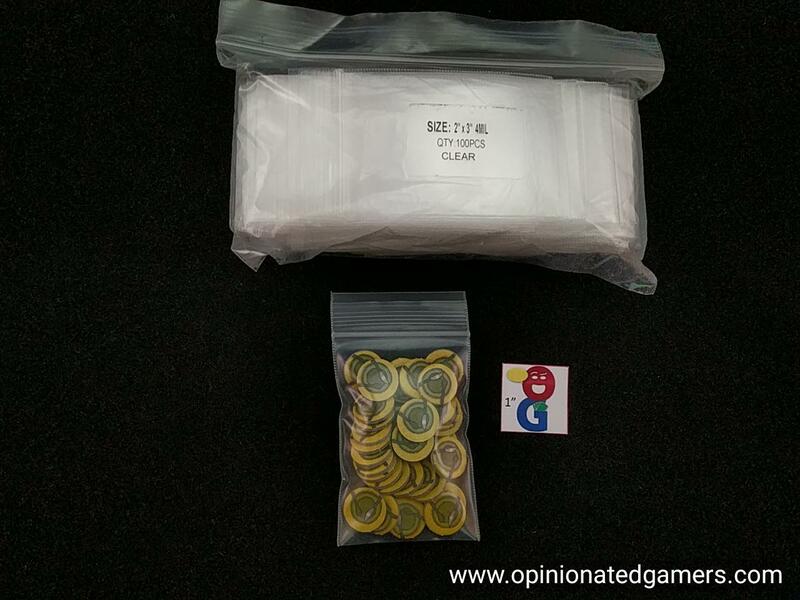 9 Responses to Dale Yu: Bagging up after Essen – new bag supplier found – Royal Bag! Thanks Dale. This review was super timely for me. I also feel it is the type of content that can be most beneficial to many of us grizzled vets. I found 2.5″ x 3″ bags that solve the “the 2″ x 3″ bags have opening that are too narrow” problem. I especially like them for 18xx stock certificates, but they’re good for a lot of things. Hello Dale, will be nice to know how you plan the logistics of cargo, boxes, customs etc. with 70 odd games on standard airfare (35 it’s ?)! Or do you end up paying airfare for additional shipping. Thanks. I think he posted his “getting games home from Essen” strategy a few years ago here. From what I remember he basically punches all the games, discards all the inserts, nests all the empty game boxes as efficiently as possible (carrying them in a duffel bag), puts components of all games into gallon ziplocs (oftentimes all mixed up) and puts all the components and boards into a (rather heavy) duffel bag or two. Yes. that’s more or less the thing. I really didn’t think there were many other people out there who deliberated over small plastic baggies like me. Good to know I’m not alone. Dale – wanted to let you know that I took your recommendation and ordered bags from Royal Bags – mentioned you in doing so. Excellent. I have been very happy with the selection. I am giving a few of the gamer kits away for Christmas presents.